This incredibly cozy French country house to rent has every ounce of the atmosphere you long for: on the estate of a gorgeous chateau, you are transported back in time. Imagine yourself the inhabitants of this ancient mill-house, now transformed into a comfortable French holiday house, enjoying the bucolic sight of water running through the canals just outside your door. On the other hand, since you do live in modern times, you won't be slowed by carriage-travel when you leave this country house rental in France to explore the sights of the area! 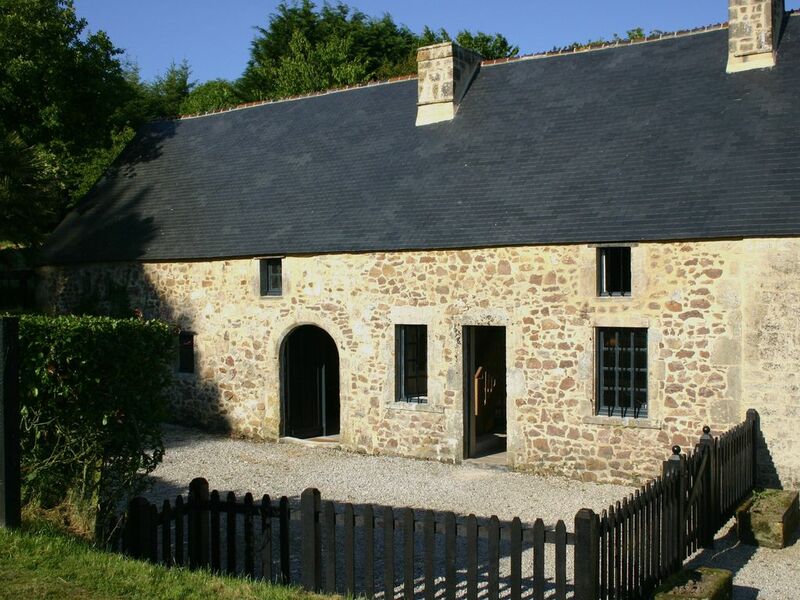 (600 m2) Once the mill-house for the estate, this country house is a 16th century listed monument. Next to the house you can still admire the old canal through which the water flowed. Located on a larger estate with a grand historic chateau, the house looks out over the estate's park, including broad grasslands and trees. It has its own outdoor area with a table, chairs, and sun lounges for outdoor dining and relaxation. Ground Floor: Entering into this comfortable, rustic-style house, you will find yourself in a living room that includes a fireplace and a sofa-bed suitable for one. There is also a separate dining room with another fireplace and a long wooden table seating eight to ten. The kitchen is well-equipped with a breakfast table, cook-top, oven, microwave, dishwasher, toaster, and electric coffee pot. This floor also has a bedroom with a 160 cm queen-size bed. There is one bathroom on this floor with a sink, toilet, and shower. First Floor: Upstairs there are two more bedrooms. The first has a 160 cm queen-size bed, while the second has two 90 cm single beds. These two rooms share a bathroom with a sink, toilet, and shower. which are both available to rent for larger groups. There is WiFi internet connection in the Chateau's reception office ONLY. The internet service in the Chateau's Reception Office is available from 8:00 AM to 8:00 PM. It was wonderful, better than the photographs. Owners very kind, helpful, and friendly. The beauty, peace, and the experience of being in a very special place--one with history and renovated with love. We enjoyed going to Bayeux, Briquebec, Saint Vaast-la-Houge. None of the small towns were walking distance, but several were a short drive. Kitchen and house are very well-equipped--no need to bring special supplies. Very good gourmet shop in Briquebec--Annick can recommend. Thought La Bisquinne in Saint Vaast was wonderful for oyster and fish fans. Directions were fine--we did use GPS. It is helpful to have some French language skills--at least a bit. This property is part of a large extraordinary estate. Bucolic setting, charming owners, breakfast in the main chateau (only 10 euro pp) where owner Annick makes her own yogurt, breads and jams, a tour of the main chateau living areas, owner Jean-Jacques' antique furniture refinishing work areas, and the exquisite grounds. Somewhat remote. You must drive to everything off of the property. Cell service is not the greatest. We would sit at a bench near the chateau for best service. You have to ask for additional towels. There were only 2 rolls of toilet paper in each bathroom. We just bought our own, but we probably could have asked owner Annick for more. Tour of D-Day sites and Mont St. Michel (owner has a recommendation for a tour guide, which we took advantage of), Cherbourg, Barfleur, Port Bail (where we watched the Tour de France) and Carteret. Negreville. Not withing walking distance. Excellent! When you think of a dream French country property, this is it! Absolutely beautiful property. Full access to the chateau, farm animals roaming the grounds, comfortable accommodations. Everything in the Mill House was authentic French -- no cheap Ikea furnishings. Close proximity to a variety of activities such as D-Day landing beaches, Cherbourg, abbeys, markets, etc. Valognes. Not really within walking distance but just a 2-3 min drive away. The chateau did have WiFi which could be used for free by sitting in the kitchen or on the bench outside. If US visitors want WiFi within the Mill House, I recommend purchasing a portable WiFi "pay as you go" hotbox from a local Orange cellular boutique. This will allow for WiFi within the Mill House and in the car while traveling, etc. The arrival instructions said to follow the yellow Chateau de Pont Rilly signs. The signs are white -- not yellow! We had a wonderful time. The property is amazing and the owners were very friendly. We had a donkey and two goats in our backyard. The Chateau was amazing and the owners gave us a private tour. No internet. But the chateau did have WiFi. We enjoyed visiting the D-Day sights, many charming small towns and Mont St. Michel. No towns were within walking distance. Bring books and board games. No internet or TV. Very smooth. They let us check in 2 hours early. EXCEEDED ALL EXPECTATIONS! The villa itself was clean, beautifully decorated, had all the necessary provisions, and was larger than expected. Hosts were FABULOUS! Welcoming, engaging, generous with their time. Helped direct us to wonderful restaurants, gave us a wonderful tour of their home, and even a published book of photos of the property with a history -- a really nice keepsake. I have two children and the hosts were so good with them!! We did NOT want to leave. In fact, I would beg the owners to sell us the Mill House if I could!!! Décor! And the serenity of the property. Variety of places to go and see small towns, beaches, history, good food. Valognes. Not within walking distance. Annick has a list of good restaurant recommendations at the property. Take her advice! We had great dinners at the Chateaux in Bricquebec and Auberge des Grottes in Nez de Jobourg is DEFINITELY worth the 30-minute drive!!! Stunning views! Go at dusk. It was easy to find! Smooth as silk and the hosts were very accommodating to our late arrival! We were delighted with every aspect. Exceeded our expectations. Annick and Jean Jacques are gracious hosts. Annick had put a bowl of fresh-cut peonies from her garden on the kitchen table to greet us, along with a box of local cookies, a bowl of fresh fruit, and some locally produced cider. The house is beautifully furnished, with amazing trompe l'oeuil artwork and museum-quality antiques. The chateau's setting is beautiful and we were entertained by the resident sheep, goats and peacocks. The grounds of the chateau are lovely and we were encouraged to explore them. There are lots of day trip possibilities: Mont St. Michel, Bayeaux, Rouen, Honfleur and the coast. Well, Negreville is within walking distance but there's nothing really there. The nearest town for groceries is Volognes, which was interesting to explore as well. The restaurant suggestions provided by Annick and Jean Jacques are good. Future renters may want to bring good books, cards, Scrabble or other games for evenings--there's no TV. We did have a GPS but could not figure out how to enter the coordinates (one of them was a negative number and we couldn't get the system to accept it). Annick declined our offer of the cash security deposit. Check in and out was very smooth and friendly. Security Deposit: Upon arrival at the property you are required to pay to the property representative a security deposit payable in cash. The security deposit will be returned to you prior to your departure minus any extra charges or accidental damages to the property. The listed security deposit is: 300 EUR.